Do you make a habit of losing your embroidery needles? Help correct that problem with a DIY needle book, featuring some of your embroidery on the cover! You'll love that you can make a project like this fairly quickly. Plus it's a great way to make use of small embroidery designs while creating something useful too! You can never have too many needlebooks because there are always more embroidery projects. This way you can keep one with each embroidery project you work on. And unlike a needle minder, a book like this keeps needles safely in place even when you stow your work for a while. Needle books also make excellent gifts for friends and family members who love to embroider or sew. This easy project starts with a small piece of embroidery. You can make something new just for this, or grab something you've already made. The embroidery on the cover of the example was made using some appliqué. For best results, read through all of the instructions before beginning. Choose a cotton fabric and felt that coordinate with your embroidery. Use wool or wool-blend felt to help your needle book last longer. Alternate option: Instead of a button, use snap fasteners that use a setting tool. This type looks more finished than sew-on snaps. Cut the embroidered fabric, cotton fabric, and batting into 4-1/2" x 6" rectangles. You can adjust this size to accommodate your embroidery if necessary. Cut a 1" x 1-1/2" felt rectangle for the tab closure. Layer the pieces as follows: batting, embroidery, felt rectangle, and cotton fabric on top with the right side of the fabric down. The small felt piece should be along the edge that will be the back of the ​needlebook, as shown, and centered from top to bottom. Pin or clip the sides with sewing clips. Sew around the rectangle, leaving an opening along the lower edge. Be sure to back stitch when you start and stop. Trim the corners to reduce bulk, but be careful so you don't clip the stitching. Turn the needle book right side out and poke the corners into shape (a chopstick or the end of a small paintbrush work well for this). Sew the opening closed with ladder stitch. Use a doubled thread and a regular sewing needle. To give the cover of the needlebook a finished look, stitch around the edge with running stitch. Use three strands of floss and a coordinating floss color. Cut two 3-1/2" x 4-1/2" felt rectangles for the pages of the book. If you adjusted the size of the needlebook, adjust these accordingly. Fold the pages in half and crease to mark the center. Fold the cover in half and crease the outside to mark the center of that side. Pin or clip the pages in place, then sew down the center spine with a double running stitch. Use three strands of embroidery floss. Fold the book in half and wrap the felt tab to the front. Use the end of the tab as a guide for the placement of the button. Sew the button to the front of the book. Cut a slit in the felt tab for a buttonhole. Be careful not to cut too much or the hole will be too large for the button. If you want to use snaps instead, attach the pieces in the same location as you would place the button and buttonhole. 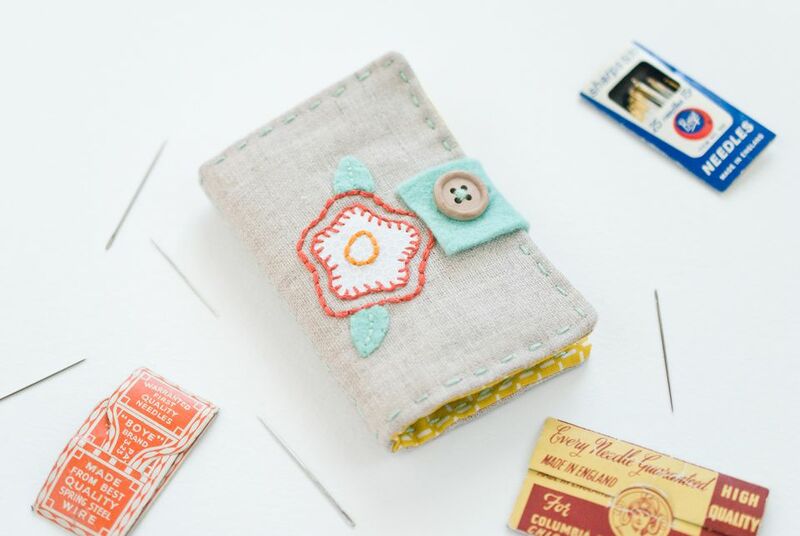 Now you have a book to store your different embroidery needles! When you finish stitching for a bit, you can safely stow your needle away so it's ready for next time.